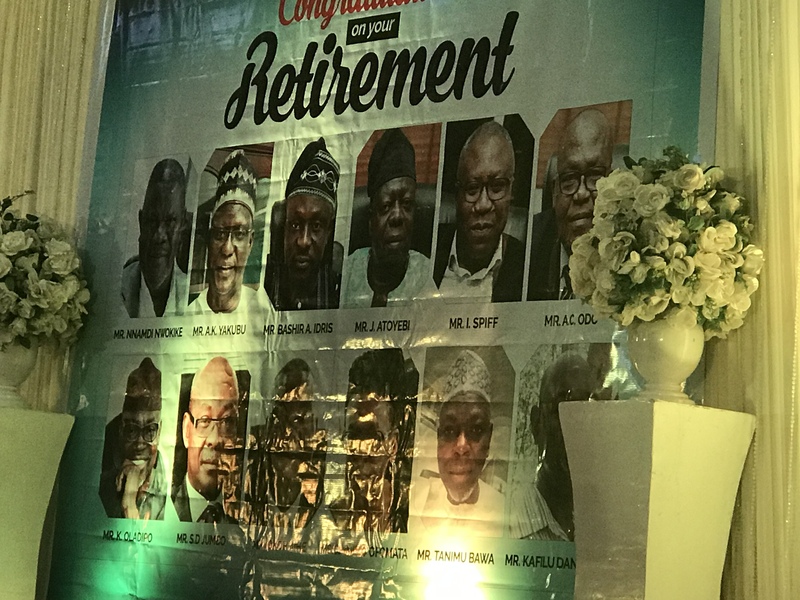 The Nigerian Communications Commission (NCC) on Friday held a valedictory service to honor some of its retirees who have served the organization meritoriously. The event which was well attended by top management staff of NCC, families and associates of the retirees took place at River Plate Park in Wuse II, Abuja. Among the list of NCC retirees who were honored at the occasion include, the outgoing Director, Public Affairs Dept. Mr. Nnamdi Nwokike; Director, Policy, Competition and Economic Analysis, Abubakar Yakutia; Head, Legislative and Government Relations, Bashir Idris; Director, Femi Atoyebi; Head, Process Administration in Corporate Planning, Strategy and Risk Management Dept. Mr. Inatimi Spiff and Deputy Director, Performance Management, Augustine Odo. Others in the list are, Director, Olawale Kehinde (Rtd) ; Deputy Director, Somieari Jumbo; Director, Okoh Ashe; Deputy Director, Legal and Regulatory Dept. Chinelo Ofomata; Engr. Tanimu Bawa and Deputy Director, Technical Standards and Network Integrity, Karolyn Danbatta. Top management staff who graced the event are, Chairman NCC Board of Commissioners, Sen. Olabiyi Durojaiye; Chief Executive Officer, NCC, Prof. Umar Danbatta and Executive Comm. (Stakeholder Management) of NCC, Sunday Dare. While delivering her address, Chairperson of the the organizing Committee praised the sterling contributions of the retirees in uplifting NCC. Her words “Your service has been very inspirational to most of us, you have left behind a laudable achievement. She noted that the entire staff of NCC is indeed proud of the retirees for their quality mentorship to the majority of staffers.